the only FDA-cleared hair removal laser available for home use. Clinical studies have shown up to 70% hair reduction after just two treatments. Hair re-growth will begin to appear lighter and finer. Hair follicles that have been deactivated by the Hair Removal Laser 4X will no longer grow hair. Continue to use as necessary for touchups. cost well over $12,000, Tria Laser 4X delivers the same permanent results for less than one office visit. 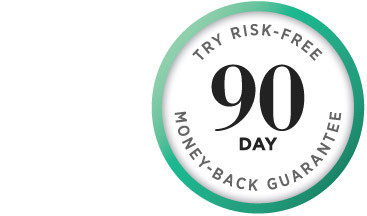 We’re so confident that you’re going to absolutely fall in love with your new smooth skin, Tria offers a 90-day money-back guarantee. If you’re not happy with your results, send it back for a full refund.